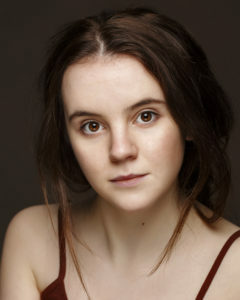 Mayo native Meg, has just recently graduated from The Gaiety School of Acting. She most recently played the character of Ciara in her own original piece “SERIOUSLY THOUGH..” as part of Ragamuffin Collective’s “EN MASSE”. Other theatre credits include McLaughlin in Fishamble’s INSIDE THE GP under the direction of Jim Culleton and The Empress of Lilliput in Conall Morrison’s GULLIVER’S TRAVELS. Meg is a passionate badminton player, who enjoys singing, dancing and reading. Meg is currently starting rehearsals for HOSTEL 16 which is part of The Dublin Fringe Festival this coming September.